The centrality of food in life, and the importance of food as life, is undeniable. As a source of biological substrates, personal pleasure and political power, food is and has been an enduring requirement of human biological, social and cultural existence. In recent years, interest in food has increased across the academic, public and popular spheres, fuelled by popular media’s constant play on the role of food and body size, and food and cooking, as a mass spectacle for TV audiences. 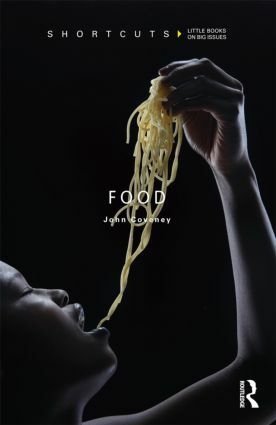 In Food, a new book part of the Shortcuts Series, John Coveney examines ‘food as…’ humanness, identity, politics, industry, regulation, the environment and justice. He explores how food helps us understand what it means to be human. Through food, we construct our social identities, our families and communities, but this book also highlights the tensions between the industrialisation of food, the environment, and the fair (or otherwise) worldwide distribution of food. It considers how the food industries, on which most of us have to rely, have also had direct effects on our bodies – whether through diet and longevity, or the development of illness and diseases. This book is for all students and general readers alike – or for anyone with a fascination with food. It questions the idea that food is merely something inert on the plate, and instead shows how influential, symbolic, powerful and transformative food has come to be. This book is part of the Shortcuts series published by Routledge, a major new series of concise, accessible introductions to some of the major issues of our times.